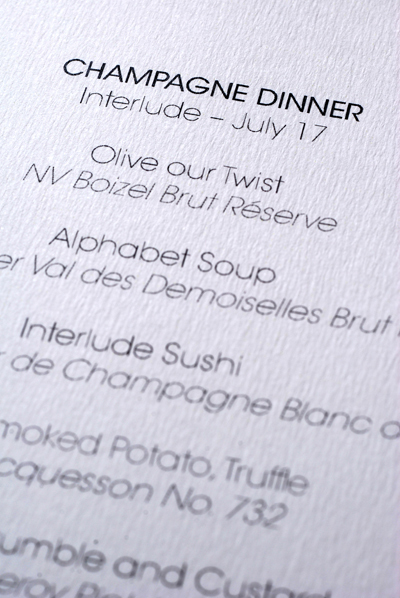 Tonight Vogue Entertaining and Travel and the Champagne Information Centre is holding a Champagne Dinner at Interlude. Al and Elle have joined us for this event and for their first visit to Interlude. I'll get the annoying part of the evening out of the way first. When booking we were told "6.30 for 7" and most of the diners tonight can tell the time and arrived when they should except for a self-absorbed 10 who decided it was far more important to be fashionably late and arrived close to 7.20pm. If that wasn't bad enough these people during the course of the night proved to also be loud and obnoxious - I personally don't believe banging your cutlery together is appropriate behaviour for adults - perhaps it is more indicative of their mental age of two. The restaurant was in a difficult position, they couldn't start as scheduled and the room was left drinking sparkling water. Unfortunately, the delay also affected the scheduling of the courses with a way too long break between the amuse and the first course. Maybe they should apply "theatre rules" in the future - don't show up on time, you get locked out. With that said, time for the food. 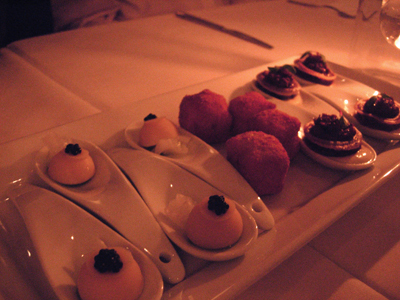 we were told to eat these from left to right and first up are a white chocolate, lycee and caviar bonbon - next was a breaded cube of macaroni and cheese and lastly, a beetroot surprise. The beetroot surprise was a liquid beetroot filled raviolo topped with braised mince that you must place fully in your mouth before biting - it's quite the surprise as the beetroot shoots out. 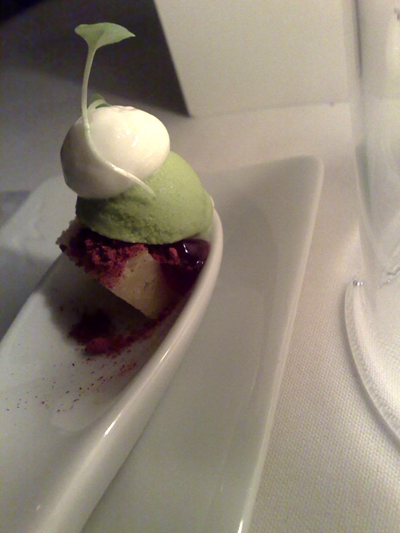 Because of the tardy ones there's a long gap between the amuse and the first course. 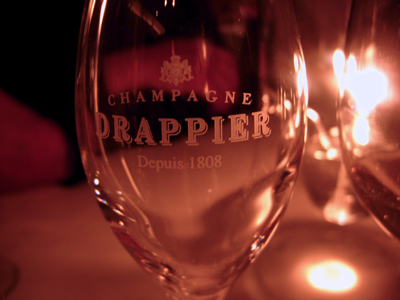 The Brut Reserve is a blend of Chardonnay, Pinot Noir and Pinot Meunier (30:55:15) and was served from Magnums. This is very much a perfect aperitif style champagne and easily handles the robust salty flavours of the dish. Olive our Twist is a dish we've enjoyed before - a twisted strand of olive jelly, studded with olive oil shards, dots of roasted capsicum and olive paste, toasted herbs crumbs, rosemary and anchovies. This is a 100% Pinot Noir Champagne sourced from one plot, the Val des Demoiselles. It is made using the traditional saignée method which we were told is rather unusual these days. 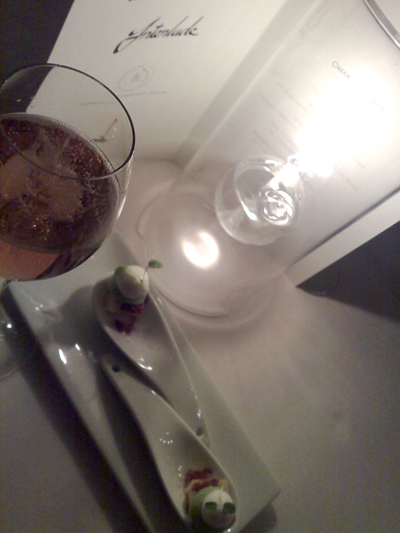 Most Rosé is made by adding red wine to the champagne to ensure a constant colour. With the saignée method the colour is obtained by leaving the skins in contact with the juice - unfortunately this makes getting a "brand" colour difficult. The Alphabet Soup is a signature dish and as it was served on a glass plate we could now work out what was holding the letters in place - they are set on a low-temperature parmesan jelly that dissolves as the rich tomato broth is poured over. 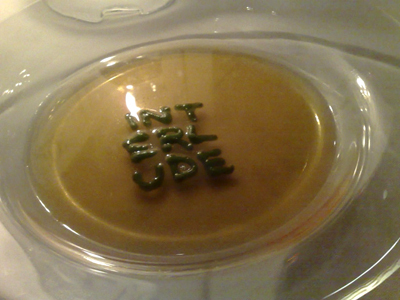 Interestingly, the letters harden on contact with the hot broth. A 100% chardonnay champagne that showcases the mineral elements of its regions soil. 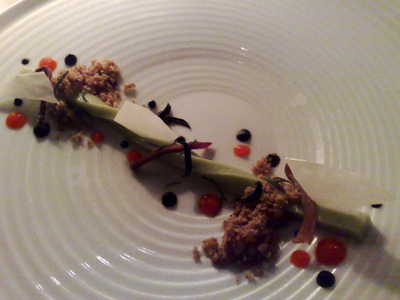 This was served with a new dish which is still evolving - Interlude Sushi. 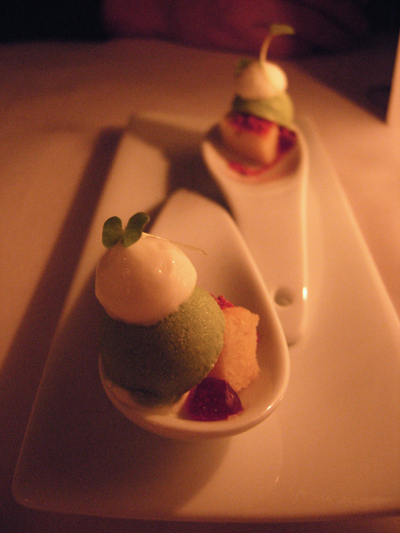 The premise is to reinterpret the flavours of sushi. At the base of the bowl was a "creamed rice" fleckled with a scattering of pink pearls of pickled ginger and a dusting of wakami powder. Slices of Marinated Tuna and Seared Kingfish were draped across the top. An exciting dish and one we look forward to trying again. 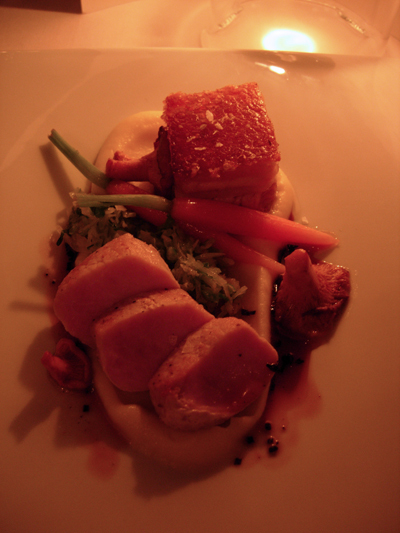 Two textures of pork - slices of pork loin and a slab of slow cooked pork belly. 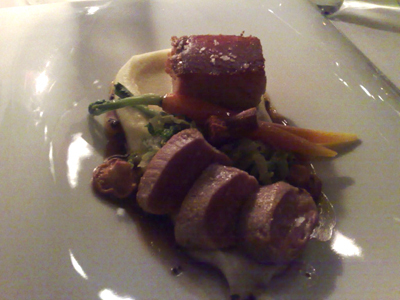 The pork belly was tender and gelatinous and was everything you expect from a well cooked pork belly. The smoked potatoes added an earthiness to the dish that was well complimented by the truffle and mushrooms. Duval-Leroy also uses the Saignée method to produce their rosé and it proved to be an excellent match to the rhubarb crumble. 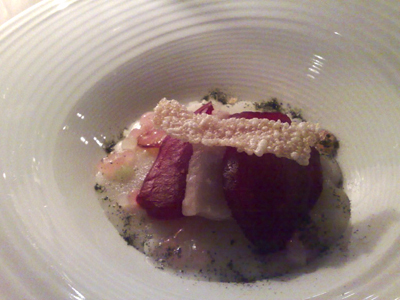 Cylinders of rhubarb ice cream lay interspersed between moulds of thick custard and crumble topping. 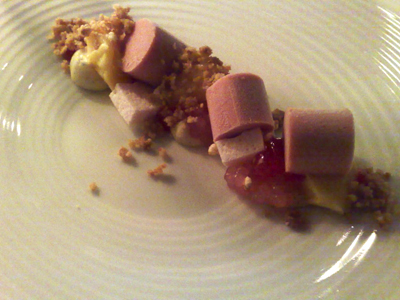 I have no trouble convincing Elle to come here for the dessert degustation after this dish! Apart from the issues mentioned earlier, we did enjoy the evening. Great blog! I've been vicariously eating and travelling through you guys. Anyway, that's probably methocel on the alphabet soup letters. oh, thank you Roberto, glad you've enjoyed the ride, unfortunately there hasn't been any travel this year. I will have to look up methocel to see what it is - it's quite fascinating to see how this all works.